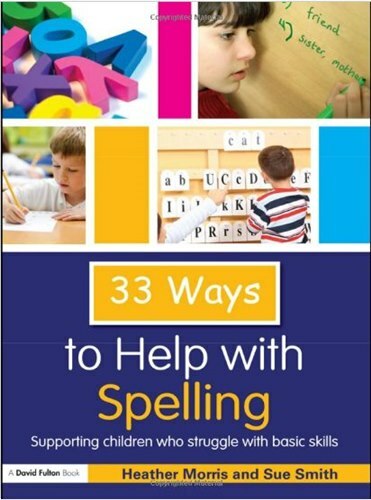 33 Ways to Help with Spelling equips teachers and teaching assistants with a wide range of practical resources to help children who are having difficulties learning the basic skills of spelling.Offering a range of activities and games to engage children and encourage motivation in the classroom, this essential classroom companion provides ready-to-use material that doesn’t need lengthy forward preparation. Activities include auditory and visual mnemonics, phonetics and tactile tasks. These practical and fun ideas incorporate a variety of learning styles, using kinaesthetic and auditory techniques, that put the emphasis on ‘games’ rather than ‘work’. The activities are especially suitable for teaching assistants working with individuals or small groups. include extension activity where appropriate to challenge pupils. Aimed mainly at primary pupils, secondary teachers will also find this book invaluable to use with pupils who are falling behind. The series facilitates good inclusive provision and is a resource from which useful ideas and materials can be taken without having to plough through chapters of theory and research.